Computer, tablet, or phone not starting, or seemingly frozen in time? Before you take it down to the local repair shop, or send it off to the professionals, here are the cheat codes to use to try and get your device back on its feet—it might be you can save yourself a hefty repair bill by fixing the issue yourself. Of course we can’t cater for every possible combination of problem that might beset your poor piece of electronics, but we can tell you about the reset and repair processes that work a lot of the time. Even if a device is permanently frazzled, you might be able to get your data off it—though you’ve already got backups in place, haven’t you? If you find your desktop or laptop computer has frozen, the first step is to wait—you don’t want to do a cold reboot if you can help it (it might end up making the problem worse), so give your machine time to sort itself out. We’re talking in the region of 30 minutes. That 30 minutes might seem like eons if you’ve got important emails to finish or reports to write, but if at all possible use a different computer, switch to your phone, or just go off and do something else to give the stricken device time to recover. And we’re talking really frozen, as in no keyboard or mouse inputs are being registered. If you’re experiencing problems with just one app, force quit it instead. On Windows, right-click on the taskbar, choose Task Manager, then pick the app in question and click End task; on macOS, open the Apple menu, choose Force Quit, then select the app and click Force Quit. If your computer really is frozen and really isn’t coming back, a firm and prolonged push on the power button is the key for just about any computer out there. Laptop or desktop, Windows or macOS, push and hold the power button and within a few seconds your computer should switch off. Again, patience is a virtue here. Wait a couple of minutes at least before tapping the power button again and turning your machine back on. With any luck, your computer problems are now over and you can carry on with the rest of the day. If your OS doesn’t appear, or the computer doesn’t respond to the press of the power button at all, some more detective work is required. A faulty power supply or battery is the most likely explanation if you get no response at all to the push of the power button—no whirring, no lights, no nothing. If you can, switch to a different power cable or even a spare battery, if you have one. The idea is to try and establish whether your computer is actually getting power, or if the power isn’t registering. There’s no getting around the fact that some trial and error is required here: Run a web search for the symptoms you’re seeing and the type of computer you’ve got (on another device, obviously). Is the display cable still attached? Did you recently change something on your computer? With hardware faults it depends where your level of technical know-how is as to where you want to draw the line and just get the professionals to take a look at your ailing machine. There is plenty of information available online you can refer to—iFixit has an excellent guide to troubleshooting a motherboard, though motherboard failures are thankfully pretty rare. But sometimes hardware isn’t the issue. Provided the problem isn’t related to the machine powering on it’s always important to double check the software before troubleshooting the hardware. That’s because software faults and corruptions are (usually) relatively easy to fix and software issues can be quickly ruled out. Both Windows and macOS are now built with a lot of self-repairing safety nets in place, as well as basic modes of operation you can use if the operating system isn’t working normally. Windows 10 will now jump into an Automatic Repair mode if it can’t boot successfully three times in a row—you can just click Restart on this screen to apply some basic fixes (we told you it was easier than it used to be). The special stripped-down, low maintenance Safe Mode for Windows is still here, but it’s hidden away. If you get dumped back to the Automatic Repair screen a second time, hit Advanced options then Startup Settings, then Restart. Hit 4 or F4 on the next screen to go into Safe Mode. The idea of Safe Mode is to get you into Windows in a basic form so you can troubleshoot problems—faulty drivers, buggy software, hardware glitches. We can’t give you specific instructions about what to do in Safe Mode, but undoing recent changes to your system is a good start, and you can at least make sure your important data is backed up safe. As a last resort, you can always reset your PC from Safe Mode: From Windows Settings choose Update & Security and Recovery, then click Get started under Reset this PC. You’ll be given the choice of keeping your data or wiping everything from disk and starting again from scratch—if your computer won’t start up after that, you’re most likely looking at a hardware fault of some kind. Instead of Automatic Repair, macOS has Recovery Mode for troubleshooting boot up problems. With your Mac switched off, hold down Cmd+R and tap the power button to get into the recovery console. The Disk Utility option is a good starting point. It scans the attached drives for errors and applies fixes where possible. You can also restore your computer using a Time Machine backup from the same screen. The macOS Safe Mode works a lot like the Windows version and can be accessed by holding down Shift right after tapping the power button to start up your Mac. Again, focus on rolling back recent hardware and software changes, or at least making sure you’ve backed up your data somewhere else. As with Windows, you can do a full software reset, which should solve most boot up problems that aren’t hardware-related. Choose Reinstall macOS from the Recovery Mode screen we mentioned earlier to wipe your local drives and set up macOS again on your device, as good as new. Our smartphones are simpler devices, which means you should have a simpler time bringing one back from a digital death, although this is by no means guaranteed (especially if your phone just tumbled down several flights of stairs or fell into a pond). As with your desktop or laptop computer, it’s worth giving a frozen phone at least five minutes to see if it can overcome its blip and sort itself out on its own. The app you were using may unceremoniously remove itself from the screen and the memory, leaving you free to restart it and carry on again. If your phone remains lost in thought for more than a few minutes, the physical hardware buttons can usually help. If you’re using a Pixel phone, Google says to hold down on the power button for 30 seconds to force a restart; for Samsung devices, press and hold the power and volume down buttons for at least 10 seconds to force a reboot. That power and volume down button trick works for phones from several other manufacturers too, including LG. Obviously there are a ton of different Android phones out there with their own combinations, so run a quick web search for your make and model if we haven’t already mentioned it. If you’re on an iPhone, Apple’s instructions depend on your model. For the iPhone X, iPhone 8, and iPhone 8 Plus, quickly press and release the volume up button, then the volume down button, and then press and hold the side button (the power button) until the Apple logo appears. If you’re on an iPhone 7 or iPhone 7 Plus, press and hold the power and volume down buttons for at least 10 seconds until the Apple logo appears. For anything earlier, press and hold the home button and the top or side power button for at least 10 seconds. In most cases, that should be enough to get your device rebooted. For phones that won’t start up from being powered off, the troubleshooting steps are similar to those for desktops and laptops. First, try charging up the phone, and if one cable (or wireless charging pad) doesn’t seem to be working then try another. 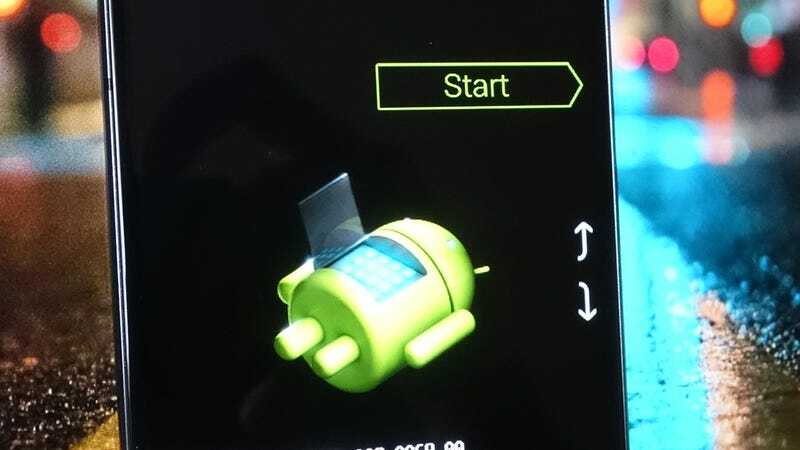 You do have one final option, which is a hard factory reset. For iPhones, you need a Windows or Mac computer running iTunes. Connect your iPhone to the computer, then restart using the hardware key combinations we mentioned above—only this time keep holding until you see the recovery mode screen (a cable and an iTunes logo). On your computer screen, click Update on the box that appears. iTunes will then attempt to restore iOS without erasing your user data. For Android, everything needs to be done on the device, and you’ll lose all your data—only try this as a last resort if you’ve backed up your data somewhere else (or you’re prepared to lose it). You’ll also need to know your Google sign-in credentials for when the device boots up again. With your phone switched off, press and hold the volume down button, then press and hold the power button until you see a robot on screen. Use the volume buttons to cycle through the options to get to Recovery mode, then hit the power button. If you see a “No command” message, press and hold the volume down button, then tap the power button. Next, use the volume keys to select Wipe data/factory reset, and press the power button to confirm your choice. The reset begins, and the phone will go back to how it was fresh from the factory. This process varies slightly between phones: On a Galaxy S9, for example, you need to press and hold volume up and the Bixby button, then press and release the power button to get to the recovery menu. Once you’re in the Android system screens, they should look similar no matter what your model of device. And if those attempts have failed and it seems as though power isn’t the problem (i.e. you can see the charging light or symbol on screen), it’s probably time to get your favorite repair shop to take a look—something inside the phone may have failed or come loose.